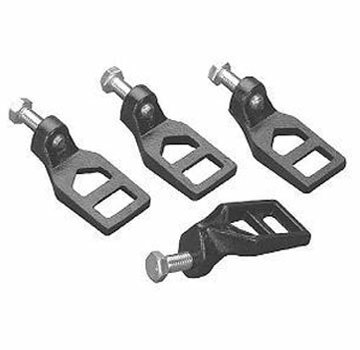 PRODUCT: ZURN CAST IRON LOCKDOWN LUGS / DRAIN CLAMPS, COMPLETE WITH 3/8-16 x 1-1/4" SECURING BOLTS. 4 PER SET. PRICE/SET. FEATURES: Zurn lockdown lugs are designed to match common roof drains. Clamping lugs are 2-7/8" long x 1-3/8" wide Dura-Coated cast iron together with 3/8-16 x 1-1/4" securing bolt. Drain Clamp Post Package, 2 1/2 in. long, #410. 4 per kit. Fits Josam # 414, # 415, # 416 and # 418 roof drains. Price/Kit.